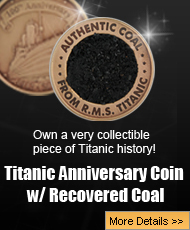 A piece of history will be available to the highest bidder this coming April as a collection of Titanic artifacts will be sold. The auction will take place on April 11, and will consist of over 5,000 pieces picked from the downed vessel. The collection will be sold in one large transaction, so those looking for just one piece of history will find themselves out of luck. Commemorating the 100 year anniversary of the Titanic’s maiden voyage, this historic event Arlan Ettinger of Guernsey’s Auction House in Manhattan will be in charge of the collection. Artifacts included within this auction include everything from a perfectly intact serving dish to a haggered 17 ton piece of the ship’s frame. Ettinger says that owning this collection will come with a great deal of responsibility in addition to fine collectibles. The eventual buyer of this collection (which is estimated at $189 million) will need to be committed to preserving the legacy of the vessel and must agree to always have at least one piece on display to the public. In fact, a court must approve the winning bidder to ensure that their intentions are preserving the history and sharing the Titanic collection with the public. 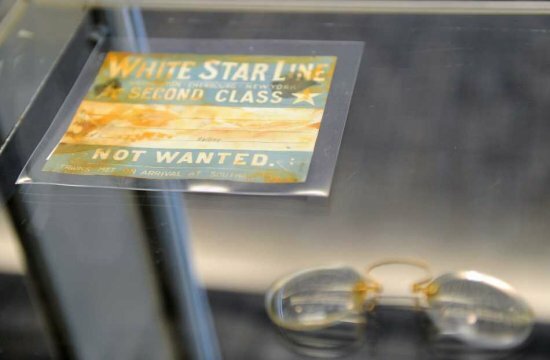 Titanic has become a piece of history worldwide as many books, movies, memorabilia, and deep-sea explorations have resulted from its failed maiden voyage where 2,223 passengers lost their lives. Discovered in 1985, the wreckage remains at the bottom of the ocean, but countless items have been recovered from the debris throughout the years. This massive collection is merely a fraction of the entirety that is the Titanic, but it is one of the largest collections ever sold. Premier Exhibitions Inc. has long been the holder of these artifacts, but has found it increasingly difficult to display the artifacts worldwide while attempting to create profits for their shareholders. The collection will now be passed along to a new steward and Ettinger says that he has already received a number of serious inquiries.